Newts are a species of aquatic amphibians, belonging to the family of Salamndriedae and have been classified into the subfamily of Pleurodelinae. They undergo three stages of metamorphosis during their life span and resemble to lizards in shape and size. Some of them are semi-aquatic and some are completely aquatic in nature. There are many species under this family and so are their different colors. As already mentioned, their bodies look similar to that of lizards but their heads resemble to that of frogs or toads. Head: Their heads are triangular shaped and are marked with two eyes on the two sides of the tiny snout. Skin: There is not very smooth but are minutely perforated for secretion of toxic body fluids. Limbs: They have four limbs, two just beneath the head and two before the tail starts. All of their limbs are equal sized. 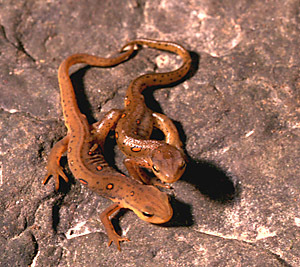 Color: Different species of the Newts are of different color. They come in green, blue, black, brown, yellow, red and even orange shades. Anatomy: They have teeth on both the jaws and possess external gills. Their limbs, spinal cord, heart, eyes, intestines, tail and both the jaws can regenerate. The cells of their injured organs heal fast and regenerate due to the presence of tumor cells chemicals in them. Size: Their size varies between 2 to 6 inches. Original distributional range of the Newts comprise of Europe, Asia, North America and North Africa. Though, nowadays they are being transported and cultured in some other parts of the world also. The absolute aquatic Newts dwell in water, permanently. The semi-aquatic ones inhabit marshy areas having giddy atmosphere and easy access to water bodies nearby. They can be traced in gardens and parks with ponds or lakes close by. Even the semi-aquatic groups come to nest in water during reproduction. They feed on spiders, insects, worms, mollusks, crustaceans, eggs and larvae of other species of amphibians. The juveniles eat tadpoles, small invertebrates and algae. Read about the behavioral pattern of these creatures. They are nocturnal in nature. 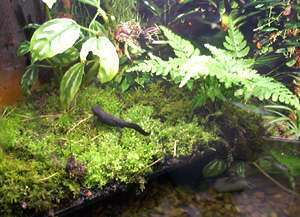 Some of the Newts are aquatic while some are terrestrial. They are sensitive to human population and thus avoid residential areas. These amphibians are not volatile in nature. They perform a number of elegant courtship rituals. 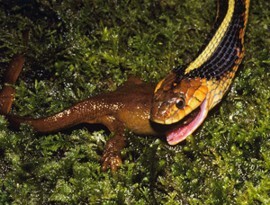 Adults are threatened by snakes, other reptiles, birds and larger amphibians. 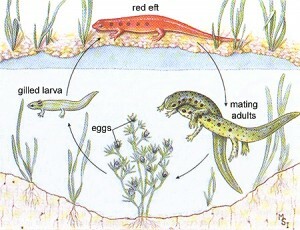 Juveniles, however, are being preyed on by adult Newts and other aquatic animals. The egg clutches are often eaten by fishes, octopuses, squids and many aquatic insects. They have very few adaptive features and even fewer defensive measures to survive. Being nocturnal, they only go out at night and roam around from hidings behind shrubs, kitsch andanything that hides their tiny existence. Their dark colored body helps them to camouflage even better behind their hidings. Their body secrets a poisonous fluid when they feel threatened, thus providing them some naturaldefense against their predators. They breathe through their skin and thus they do not need to open their mouth while under water, saving them from chocking. Some species of this family have slimy bodies and thus can squeeze out of their predators’ grasp. These amphibians mate between the months of May through July, approximately. 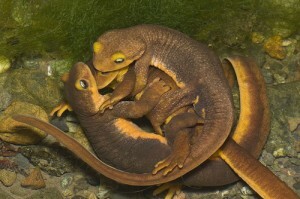 The mating procedure of Newts is prolonged with a span of elaborate courtship rituals. The courtship, mating and reproduction take place under water, in ponds, lakes and slow flowing streams. After the courtship, the males drop their germ cells and the female Newts in-take those externally. Females lay fertilized eggs and attach them to aquatic rocks, plants, leaves, etc. The tadpoles look like tiny fish fries. They have external gills attached to side of their neck region, which shreds off once they attain Eft stage and move to land from water. As they metamorphose in efts from tadpoles, their limbs emerge first of all the features. They reach adulthood within 1 to 2 years from birth. Life span of this family of amphibians varies from species to species. Their least life span can be 10 years and the longest can be 20 years. 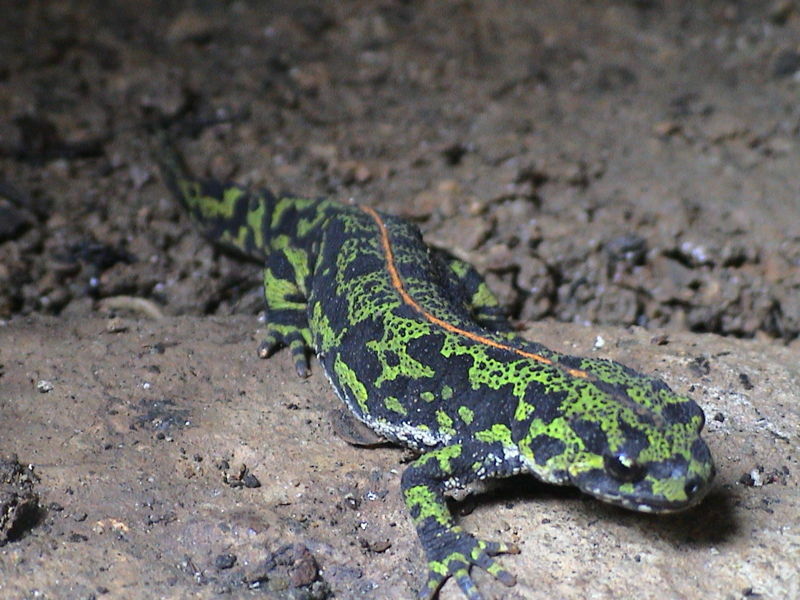 They tend to live longer in captivity, be it of any sub-species of the Newt family. 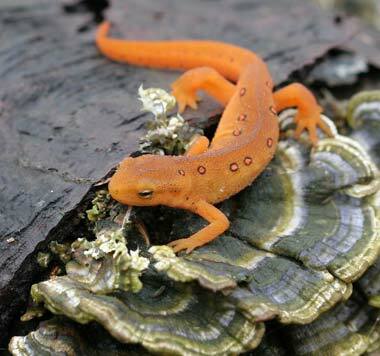 Read about the common differences between salamanders and newts. Both the species belong to the same family of Salamndriedae. Though at a glance both the species of amphibians might look very much similar but their skins have different texture. 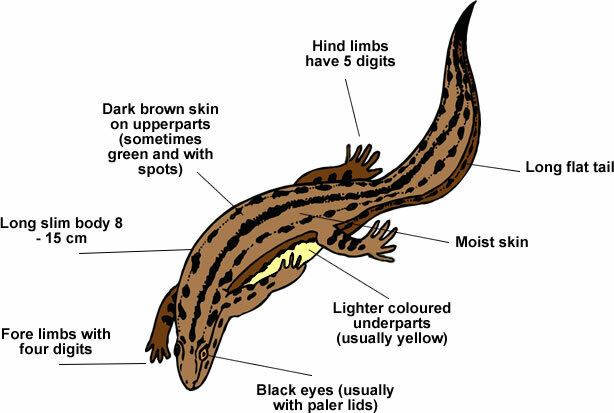 Salamander has smooth skin and newts have slightly porous skin. In common terms, aquatic salamanders are called newts, which is scientifically incorrect. Housing: House them in a glass tank with enough space for them to roam around freely. If housing a male and female together in the tank then provide them with enough natural aquatic plants and land masses placed artificially inside the tank, for mating. Being nocturnal, they are sensitive to lights, so keep them in partial shade. Feeding: They are not fussy eaters. Give them earth worms or any other worms, small insects, etc. Care: Though they secret toxins through their skin but still they can be safely handled. Make sure that the toxin does not go through inside your skin layers via cuts and injuries. Some of the sub-species of these amphibians are threatened to their very existence. Most of the species in Europe are endangered and thus it has been illegalized to pet them without proper government permission documents. Apart from the European sub-species most of the other ones are safe. Find out some fun and intriguing facts about this species of aquatic amphibians. Japanese firebelly newts have been observed to reproduce their eye-lenses for about 18 times in a span of 16 years. Some of the semi-aquatic groups of this species permanently settle down in aquatic bodies since the time of their mating in there. The external gills of the new born tadpoles have feathers that look like bird feathers. They are extremely sensitive to artificial pollution. Hence, population of newts in a particular area istaken into account while checking on that area’s health ambiance. 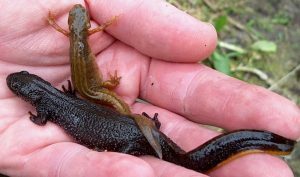 See the pictures of Newts given below visually enabling to differentiate them from other closely similar looking species.